I understand that dental treatment is often viewed as being too expensive, so my aim is to make dental treatment affordable for everyone. In the last few years I have extended my knowledge and skills beyond what a regular dentist can usually offer and now routinely provide treatment into many specialty fields. This allows me to give you the right treatment all under one roof at a lowered cost. This can save you multiple potential trips to metropolitan areas to see specialists. Frank graduated from the University of Queensland in 2013. He joined Marius St Family Dental in 2014, having been hand-picked by Min for having the desire to work with his patients to ensure that they are happy with their smile and chewing function, and for having high ethical standards for his work. Hi, my name is Krysten, I am a Dentist at Marius Street Family Dental. I moved to Tamworth at the start of 2017. I come from a small town called Baranduda, near Albury-Wodonga in North East Victoria. Tamworth is a similar size to Albury-Wodonga, which I much prefer to any of the capital cities. We have lived in Tamworth since I was 8 years old and Tamworth will always be what I call my home. Growing up, my little brother and I were always running around the dental surgery while mum was trying to work (sorry!) but back then, the practice was just a place of familiar faces and lots of people to drive us to school or sports. I began my dental career working as a dental assistant at Marius Street Family Dental back in 2009. After many years of assisting, I became more passion about dentistry and decided to apply to become an oral health therapist. 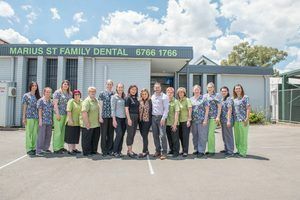 Hi I'm Barbara Upton, Practice Manager and I have worked at Marius St Family Dental since 2011 and before that worked for many years as a Small Business Owner. I am a mum of 3 children ranging from 20 to 13 and understand the challenges families and mums face in working and running a family. Hi! I'm Nicole, Marius Street Family Dental's Hygienist. I have been a member of our team here at Marius Street Family Dental since 2004. I am a mother of two young children and they keep me really busy through the week. I enjoy many aspects of the dental field and so have many roles in the practice as I like the challenge of always learning new things. I have been a dental nurse at Marius Street Family Dental since 2009. As I personally like things to be clean and organized, it didn't take long to feel right at home with the infection control side of things. Watching patients leave feeling happy and comfortable was also another aspect that drew me in.